Sales and marketing efforts behind a new drug launch can vary significantly by brand and this post highlights five distinct drug launch “phenotypes” observed through transparency data. These case studies are intended to provide an evidence-based perspective on how pharma companies are currently focusing efforts to engage healthcare providers…and how this varies based on company size, product novelty, competitive intensity and setting of care. “The Bolus” in many ways is a vestige of the traditional pharma model built around an anticipated blockbuster. Although increasingly rare, this launch strategy is seen among top 20 pharma companies leveraging a large existing sales force to enter late into an established market. 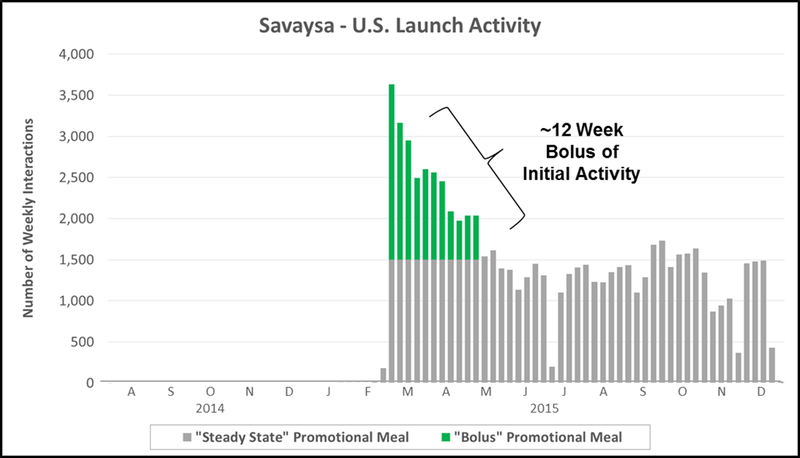 The chart below highlights reported personal promotional activity (e.g., paid physician meals) from Daiichi Sankyo’s launch of Savaysa (a 4th to market NOAC). “The Specialist” has become increasingly common across major therapeutic categories in which a subset of specialized physicians have significant influence on standard of care. 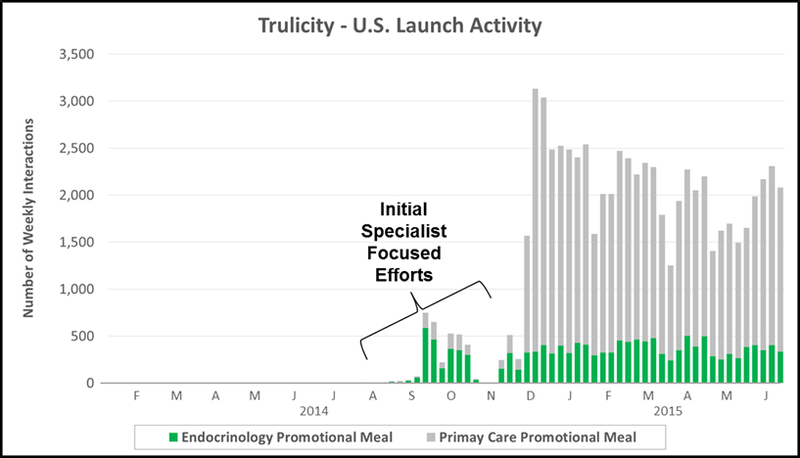 The chart below highlights personal promotional activity (e.g., paid physician meals) for Eli Lilly’s launch of Trulicity (a GLP-1 for Type II diabetes). Lilly focused almost exclusively on endocrinologists before later engaging a broader set of primary care physicians. “The Reprint” which is often leveraged for hospital-focused products or in complex markets with nuanced patient types. The chart below highlights promotional activity for the Medicine Co’s launch of Orbactiv into the severe infection market. 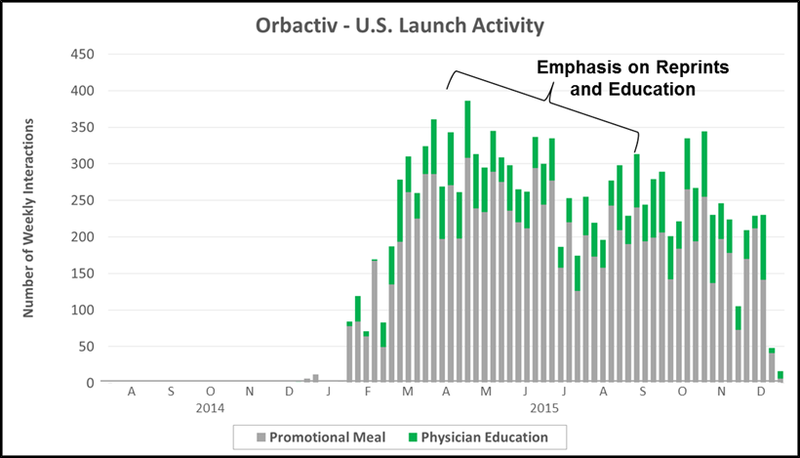 Physician education (e.g., journal reprints and clinical case studies) played a significant role in the first year of launch – aimed at driving awareness of Orbactiv’s efficacy and target patient populations. “The Podium” is generally employed to launch novel therapies (e.g., new MOA), often times into orphan/rare disease markets. 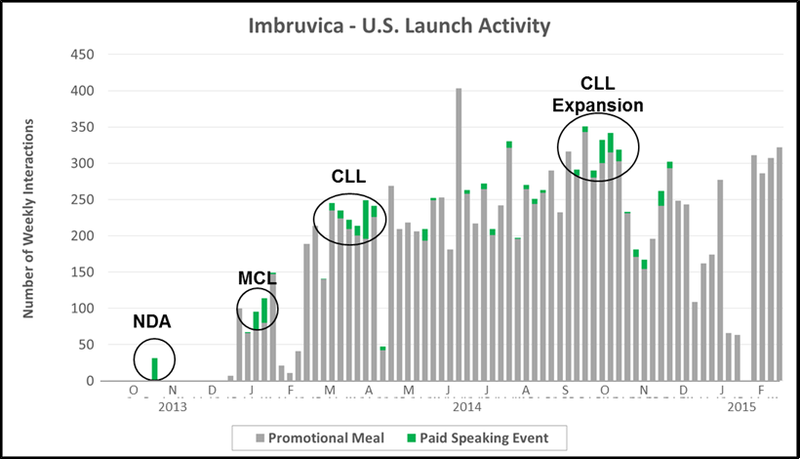 In the chart below we highlight paid speaking activity for J&J/Pharmacyclics’ launch of Imbruvica. Interestingly, a recurring cast of ~80 high profile speakers were engaged to drive product awareness around key inflection points for the product (e.g., NDA filing, initial approval, and indication expansion). “The Switch” requires the simultaneous sun setting of a legacy product and ramp up of a replacement product that plays in the same market. The chart below highlights promotional activity for Eisai’s Aloxi and Akynzeo. 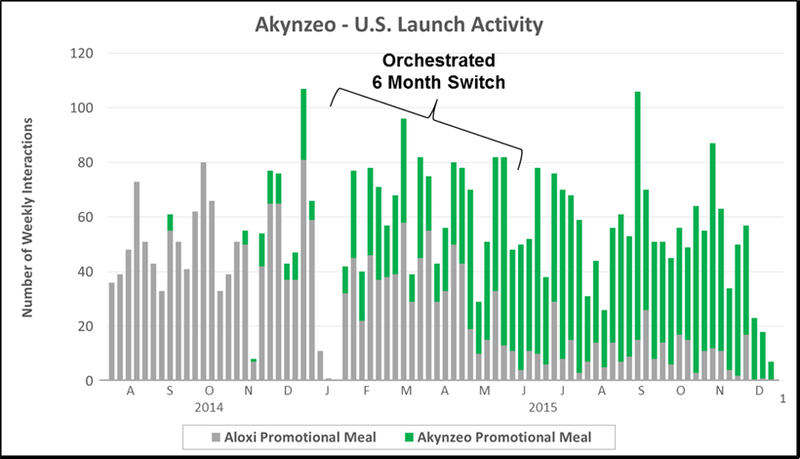 Importantly, Eisai executed a ~6 month promotional “switch” from Aloxi to Akynzeo within the CINV market. 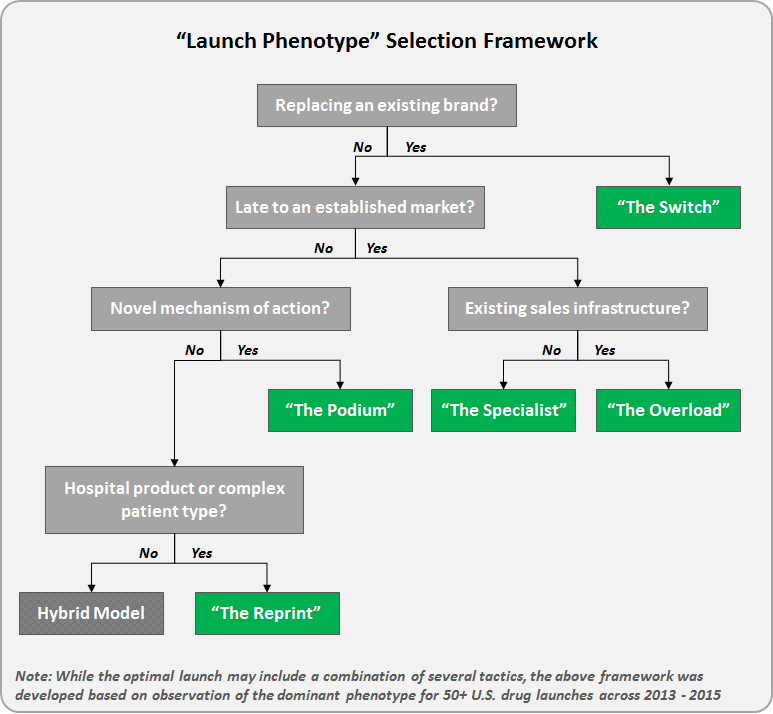 While most new drug launches will ultimately require a multi-faceted rollout, taken collectively these observed phenotypes can provide a working framework to guide marketers to key tactics that should be featured based on specific market conditions/scenarios.